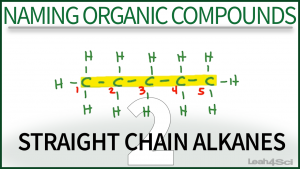 This naming tutorial video takes you through the basics of applying the puzzle pieces ‘first name’ and ‘last name’ when it comes to naming a straight-chain or simple alkane. Video includes a number of practice problems for recognition of line structure, condensed formula, and structural formulas. This is Video 2 in the Naming Organic Compounds Video Series. Click HERE for the entire series. This is extremely helpful, thank you! !